The Samblis/Collins breakup was a little over 3 years ago. After all the blustering by Mr. Samblis… lets take a look at where the breakup stands now that there is the factual history to refer to. For starters take a look at the below 2 graphics (click to enlarge). It seems glaringly apparent in which company CEO the talent resides. 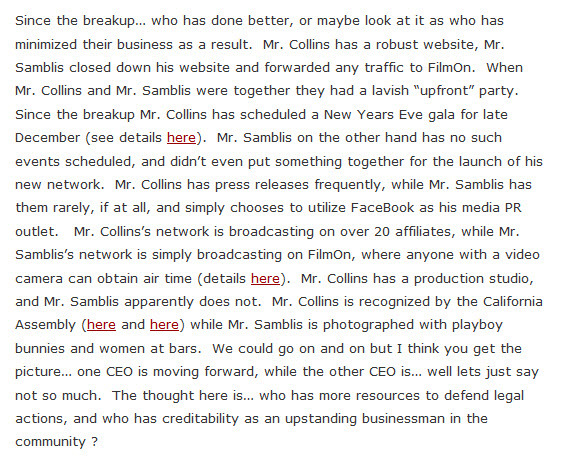 It appears Mr. Collins is eclipsing Mr. Sambils five-fold. We took some time to review the PUNCH-TV website ( http://www.punchtvstudios.com/index.php/en/ ). It is very impressive. There is a very aggressive plan in place to move the company into even greater success than it enjoys today. Mr. Samblis on the other hand, well, not so much. IMTV is “dark”, and many believe Mr. Samblis is still in charge, in spite of the much publicized “Private Transaction“. It seems apparent that had the breakup not happened, Mr. Samblis would be in a far better position than where he apparently is today. Below is an excerpt from a post we made on December of 2013. Since that time, we have documented where Mr. Samblis has had some significant legal issues relating to money. He has also failed at his attempts to silence his critics by attempting to erase his past history in business… well, the unflattering historical events anyway. Mr. Samblis is quick to point out years old events in his life that he likely believes are flattering, but goes to great lengths to erase the unflattering events, of which there are many. This blog has documented the lengths Mr. Samblis will go to in order to erase his recent past, such as here and here. Also, just type in the word “judgement” in the search box at the top-right of this page, and you will see numerous examples of legal issues and related items. It seems apparent, now that time has passed, which man was the better half of the partnership. Many believe that had Mr. Samblis simply swallowed his pride and let Mr. Collins call the shots, IMTV would be in a far better place than it sits today. 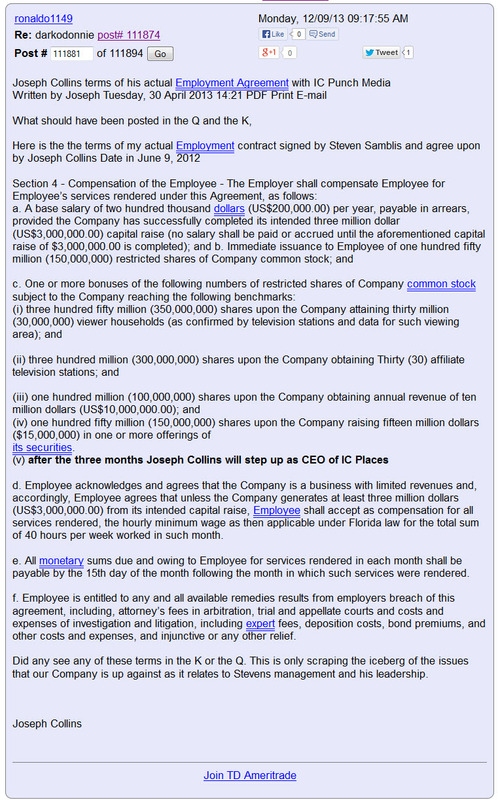 Documents support Mr. Collins position that he was to “step up” as CEO. Had he been allowed to do so, and as Mr. Samblis apparently promised, many investors may have been in a far better position today. So… congrats to Mr. Joseph Collins. As they say… money talks, and BS walks. Mr. Collins has proven his ideas were/are the superior ones. Mr. Collins and his company are on the move up, while Mr. Samblis doesn’t appear to be doing much at all. Its a shame, if only Mr. Samblis had recognized that Mr. Collins had more talent than himself, he could be enjoying greater success like Mr. Collins. Yet another new alias has recently shown up on Investors Hub…”WORRIOR Days“. This alias born 12/10/2016, and has had 8 posts… 6 of them slamming Joseph Collins, and 2 initiating questions some would characterize as soliciting interest in the stock again. Now… 3 guesses who this might be, and the first 2 don’t count ! Looks like there may be a new pump in the works. It’s been a while, and likely enough time for many of those previous investors to have moved on, and therefore perhaps less resistance from those who have vast experience with Mr. Steven Samblis, to tell others about their experiences with Mr. Steven Samblis and his business dealings. This tactic of promoting the notion that Mr. Samblis has sold the company and moved on… is simply not supported by the facts. The critical fact is that no one has seen the contract of sale. Mr. Samblis, OR, Mr. Joseph Sirriani has not made it public, or, filed it with the SEC. This is a HUGE RED FLAG !!! What are they hiding??? Don’t be fooled by what you can’t see, and judge what you can’t see on the history of Mr. Steven Samblis. The only reasonable conclusion one could come to is BEWARE !! !